BANGI, 24 Dec. 2010 – The global food crisis which causes about one billion people on Earth to starve is more due to human greed and lust for political power rather than the weather, the environment or problems of distribution or prices as widely believed. Emeritus Prof Walter Leimgruber of the Department of Geosciences, Geography Unit, University of Fribourg (Switzerland) said all too often in the past, food crisis had been blamed on factors like the weather and environment or shortcomings in the distribution channels and prices. Thus solutions to the global food crisis had been sought exclusively from the environmental and technical areas where the blame for harvest failure is pinned on climatic reasons, inadequate food distribution channels or food prices and such. “While these factors undoubtedly play an important role, they are not the only reasons why about one billion people on our Planet suffer from hunger and/or malnutrition,” he told the International Conference on Ethics and Professionalism that was held here earlier this month. Rather it is the lust for power and the greed for material gains that have transformed food into a political and neoliberal playing field with dire consequences for the underprivileged and the poor, said Prof Leimgruber. It was thus imperative that food production be for people’s nutrition rather than only for material profit and political power. Another speaker, touching on the complex and weighty issues of ethics and professionalism in the realm of bioethics offered LOVE (which is Life Oriented Value Education) as the need of the hour. Jayapaul Azariah, former professor and head of the University of Madras, said the factor that is at stake is life itself. “Selfish gene has knocked off the ability of humans to show love. Therefore a curriculum that could impart contentment and purpose in life is the need of the hour,” he declared. 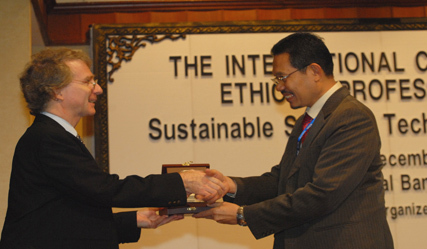 Prof Azariah, who is also the founder president of the All India Bioethics Association and past president of the Asian Bioethics Association, argued that any curriculum in bioethics should therefore safeguard the dignity of life, the reverence and respect for life and a better regard and attitude for human lives. He had touched on a myriad of issues ranging from the “ridiculous” concept of “compulsory euthanasia” for the over 80s advocated by some parties in Australia, assisted suicide and genetically modified crops. He also spoke about agrochemical and the human health, the danger of defining a girl who menstruates at 7 as an adult, surrogate mothers who sell their wombs for money and sperm donors. Datuk Dr Mohd Tap Salleh, head of the Malaysian Institute of Integrity, in his paper spoke of the need for values, ethics and good governance in the public service and stressed that holders of public office must be transparent, sincere and accountable to their superiors and subordinates as well as to their clients. “A country which is perceived as being high in integrity will be more attractive to investors and this is amply demonstrated by the CPI-TI (Corruption Perceptions Index – Transparency International) index where countries perceived to be most corrupt (very low index) are also the least developed socially and economically,” he said. Dr Mohd Tap believes that good governance is a shared commitment, where the political leadership has a duty to lead by example, by putting the interests of the country above everything else while the public servants have to adopt noble values and ethical behavior in delivering their services. Dr Darryl Macer, regional adviser on Social and Human Sciences in Asia and the Pacific of the Regional Unit for Social and Human Sciences in Asia and the Pacific (RUSHSAP) of UNESCO, in his paper on “Ethical Decision-Making For Patient Care and Public Health” pointed out that protecting the dignity of the people is a universally agreed goal of the United Nations which applies equally to individuals and communities. “This demands empowerment of people and self-determination,” he said. “There is a common goal to develop decision making ability at all levels of society so our society can evolve ethically to one where people can make their own decisions and thus be more responsible for them,” he told the conference which saw the tabling of 91 working papers and review articles over two days. 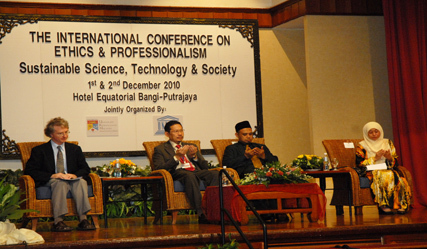 The conference with the theme “Sustainable Science, Technology and Society” was organized by the Centre for General Studies of Universiti Kebangsaan Malaysia (UKM) and RUSHSAP of UNESCO, Bangkok. It was attended by participants from India, Pakistan, Taiwan, Japan, Thailand, Iran and Malaysia. He said all sectors of society are faced with ethical issues in the pursuit of their choices and thus there is need for responsibility. “Critical to building the capacity of individuals and society for this open reflection on their choices are educators. “The task of an educator includes empowering their students/learners to develop their maturity as individuals as well as being able to be cooperative members of the changing societies,” he added. UKM Vice Chancellor Prof Tan Sri Dato’ Dr Sharifah Hapsah Syed Hasan Shahabudin in her opening address said it was timely to bring issues related to ethics and professionalism to the fore, given the big corporate scandals that had disturbed the business landscape around the world. “The scandals that involved big companies such as Enron, Arthur Anderson, Morgan Stanley, Worldcom and so on, had awakened the people towards the importance of ethics. “The number one reason of these scandals comes from infectious greed of the corporate leaders who are usually professionals,” she said in her address which was read out by her deputy, Prof Dato’ Ir Dr Hassan Basri (Academic and International Affairs). She also said that many university curricula, including UKM’s, are now earnestly applying the teaching of ethics and for good reasons. 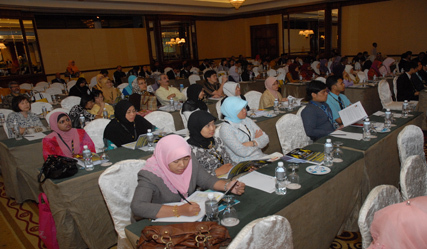 “Young minds will take this information into the workforce and understand that ethics needed to be applied there as well as in private lives,” she said, adding that UKM as an agent of change, feels that it is timely to bring ethical and professionalism issues to the forefront, to ensure that healthy society is not only a society with high per capita income but also a society that practises good ethics and professionalism in all fields.